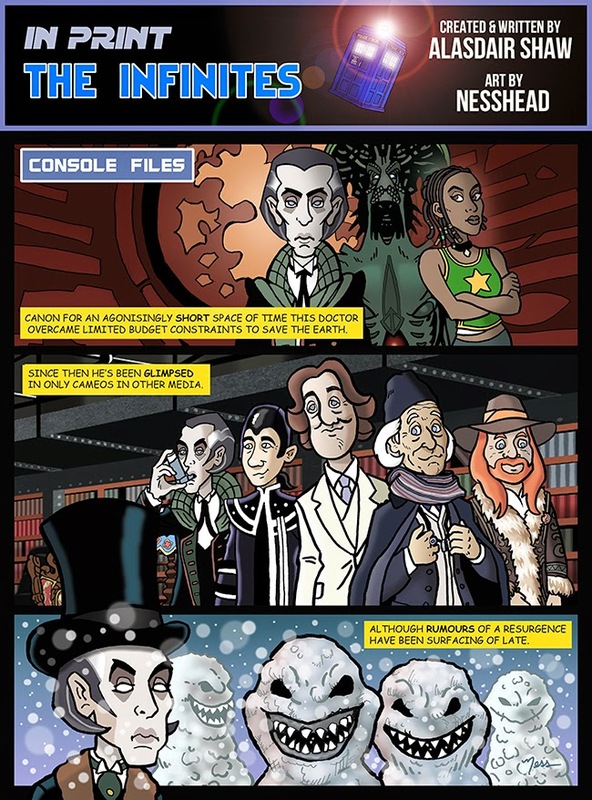 The first panel is obviously from 'Scream of the Shalka' and the last panel is the Great Intelligence and his Snowmen. I'm pretty confident that most, if not all, of you will have known that. I am annoyed at myself for forgetting to mention 'The Feast of Stone'. The middle panel is a different story though. I asked Nesshead to draw a scence from 'The Tomorrow Windows', an EDA where the 8th Doctor looks into a mirror type device that shows his possible futures. Naturally when you're the Doctor the future is in a pretty constant state of flux, however just over ten years ago the Doctor had several futures due to New Who not quite being ready. We knew Christopher Eccleston was coming, but none of us dare hope this would be any more successful than the TVM. So the gentlemen in the middle panel are a representation of the possible futures that were floating around when 'The Tomorrow Windows' came out. 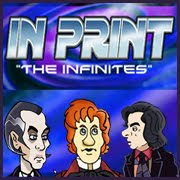 On the far left you should all recognise the Shalka Doctor. The Valeyard should be a pretty familiar sight by now, although no-one's quite sure where his ponytail came from and this book (and now this strip) represents its only appearance. Next up is the Minister of Chance as played by Stephen Fry in 'Death comes to time', with the apparent death of the 7th Doctor at the end of the BBC Webcast there was speculation that Fry could inherit the role. I wouldn't have been upset at that idea. The 1st Doctor's presence confused me for a moment until I did some reading up on fan theories of the time. Turns out that more than a few fans felt that McGann's Doctor was a young version of the 1st Doctor. Not a theory I agree with, but I can see the reasoning behind it. And finally we have Merlin. The Doctor was first referred to as Merlin in 'Battlefield' back in 1989 when one of Arthur's knights recognised the 7th Doctor as an earlier regeneration of the man he knew as Merlin. The Target novelisation went further and featured a potted history of Arthur and Merlin along with a description of this version of the Doctor. 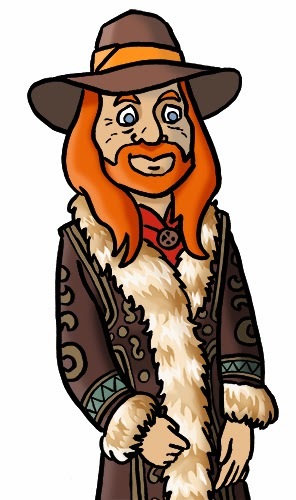 This ginger version of the Doctor and his Afghan coat went to make sporadic appearances in some of the New Adventures and some of the BBC Short trips. A much older version of him appeared in 'Birthright' and then 'Happy Endings'. 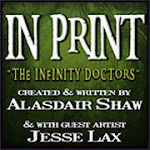 I've always loved this version of the Doctor and I was always upset that there was no art of him. There was also mention of the actual 9th Doctor, the Fatal Death Doctor, Eddie Izzard and Alan Davies. Izzard and Davies were pretty common fan choices back before the show rebooted, I'd have been ok with Izzard, but Davies would have irritated me. But there just wasn't space to include everyone mentioned in that scene. That and Nesshead needs to have some time where he's not drawing.